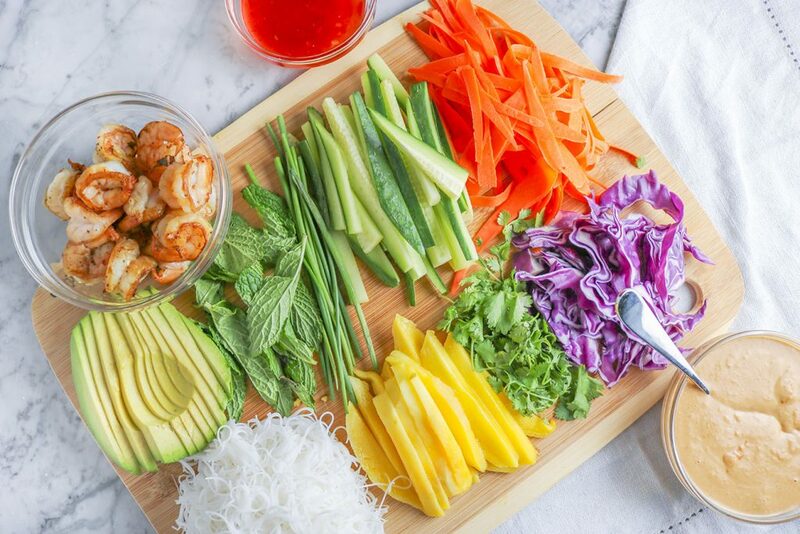 I LOVE THESE SHRIMP AND AVOCADO SPRING ROLLS! They are so fresh, so healthy, and SO delicious. And better yet – they are easy peezy to make! The hardest part is honestly cutting up all the veggies. Shrimp and avocado is one of my favorite combos. Let’s be real though – avocado and anything is awesome. In a sandwich, in the form of guacamole, with eggs, on toast, in salad – you can’t go wrong with an avo-ca-do. 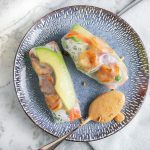 I love the combination of fresh veggies in this Shrimp and Avocado Spring Rolls recipe – cucumber, carrots, red cabbage – they give such a lovely crunch that is so well complimented by the creamy avocado. Lately, I have been trying to incorporate fresh herbs more into my diet and recipes. When I am cooking something quick, I never think to use them – but they make a HUGE difference. I have started buying fresh herbs just to have around so I can test them out with different other ingredients – it really has been so helpful! 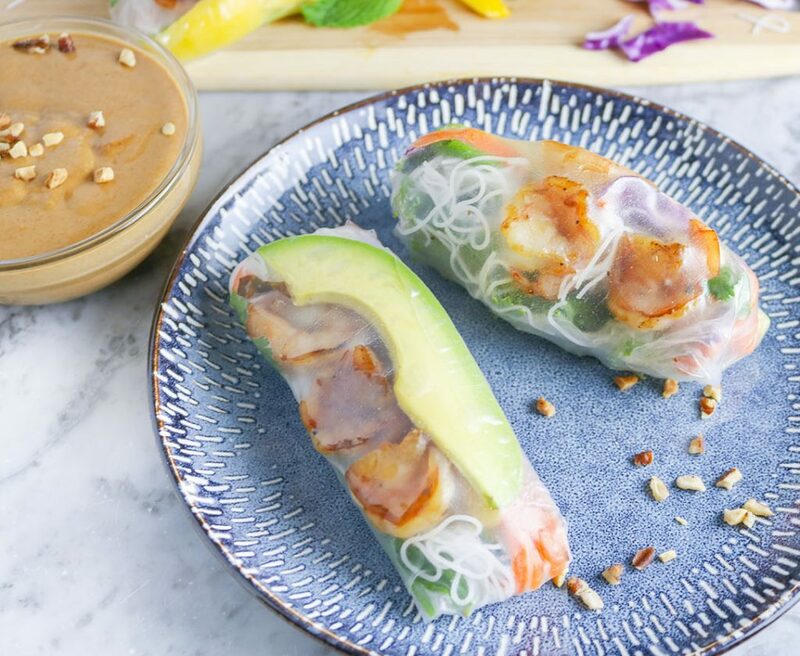 When I was researching to create this recipe, I read about people using all types of herbs inside their spring rolls – cilantro, chives, basil, or even mint! Once again, I didn’t think it would make that much of a difference, but I figured why the heck not give it a shot. OMGGGGG it ABSOLUTELY makes a huge difference!! Especially the mint! 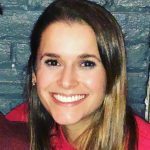 I was shocked by how much I LOVED the mint! In this recipe, I chose to use cilantro, chives, and basil (Thai basil is wonderful if you can find it in the store!) – I thought the basil paired better than mint with the shrimp, what the mint is seriously also so delicious! 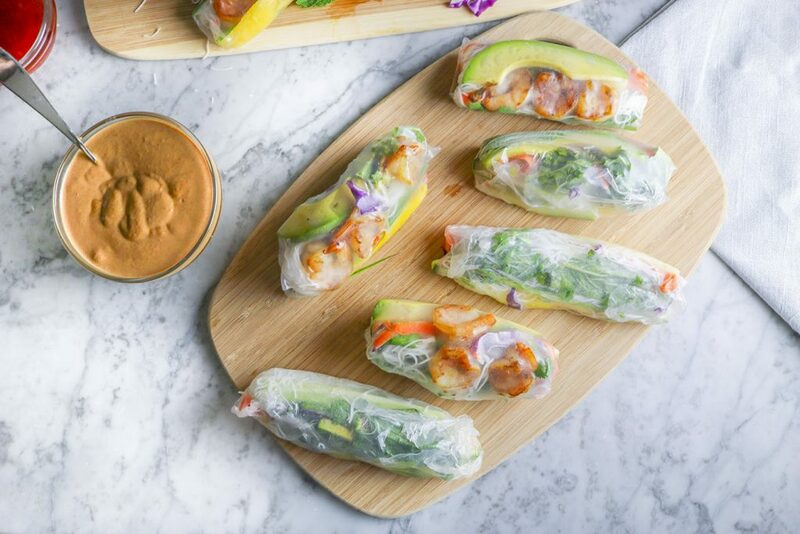 I use mint in my Mango Avocado Summer Rolls recipe – they are unreal. Mango and avocado – who knew? Then there’s the Spicy Thai Peanut Sauce – people… if you have not tried this Spicy Thai Peanut Sauce, you MUST! It is UNREAL! 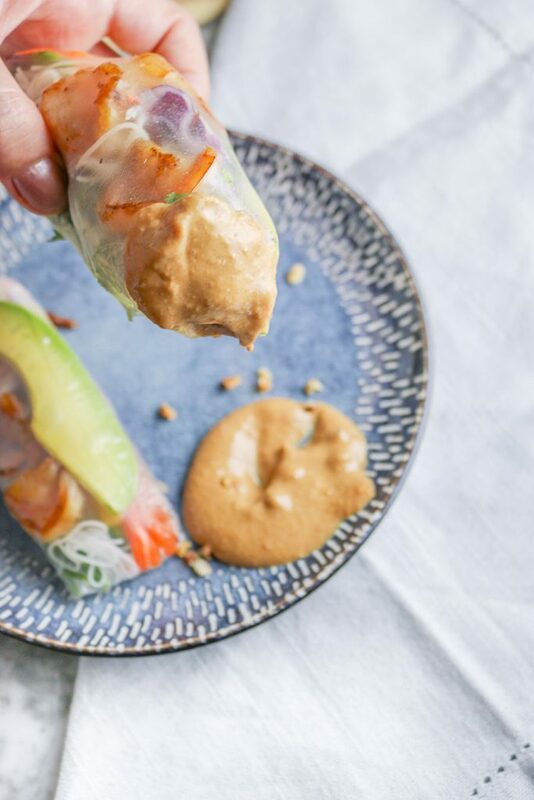 It seriously makes everything taste better – even these already delicious Shrimp and Avocado Spring Rolls. 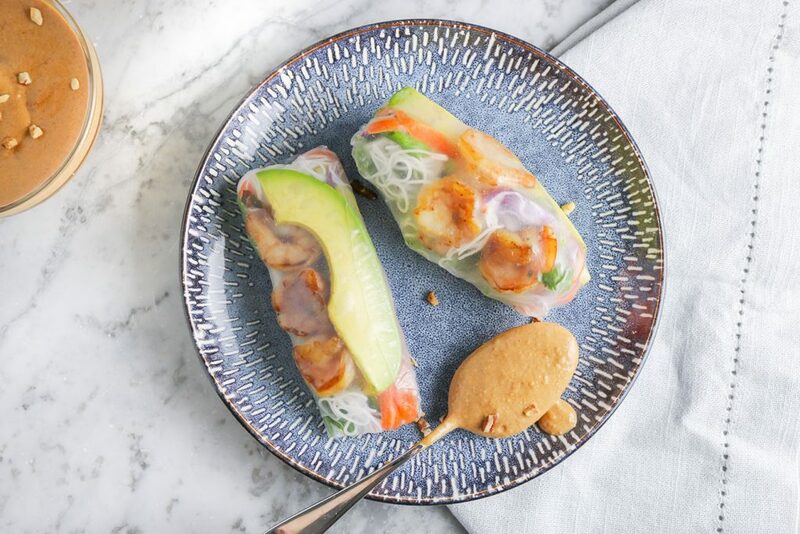 Tender shrimp, creamy avocado, crunchy vegetables, and fresh herbs – all topped with al dente vermicelli and then wrapped up perfectly in rice paper, just ready and waiting to be dipped in Spicy Thai Peanut Sauce! YAS!! HEAVEN. ON. EARTH! Give them a try! Feel free to add/remove/substitute different veggies and proteins as you please! Are you vegetarian? Swap out shrimp for tofu! Or maybe add more veggies! You can’t go wrong! 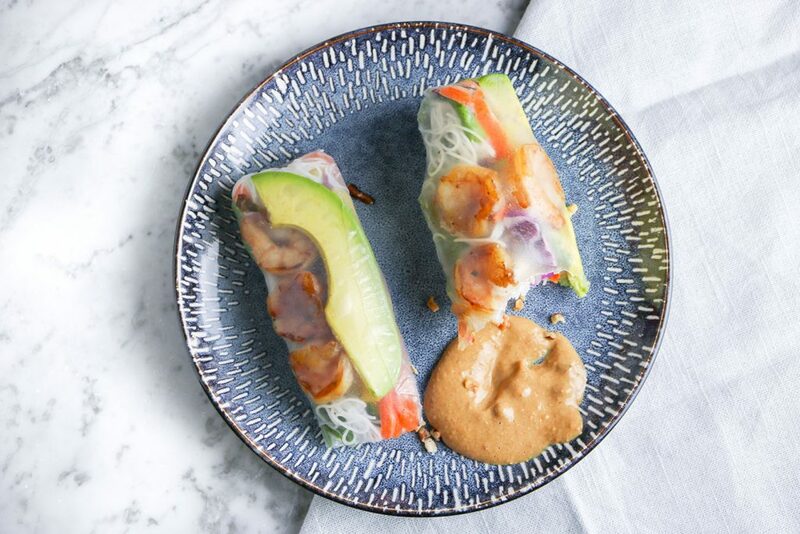 Tender shrimp, creamy avocado, crunchy vegetables, and fresh herbs - all topped with al dente vermicelli and then wrapped up perfectly in rice paper, just ready and waiting to be dipped in Spicy Thai Peanut Sauce! Prepare all ingredients as directed and set out on a board or plate for assembly. (If shrimp are not cooked, cut in half then toss with 1-2 tbsp olive oil and season as desired - cook in a hot skillet for 1-2 minutes on each side or until no longer translucent). Fill a shallow bowl with warm water (I used a shallow pasta bowl), set aside. Soak one piece of rice paper in warm water for approximately 10 seconds. Shake off excess water then lay wrapper flat on plate or BOARD. 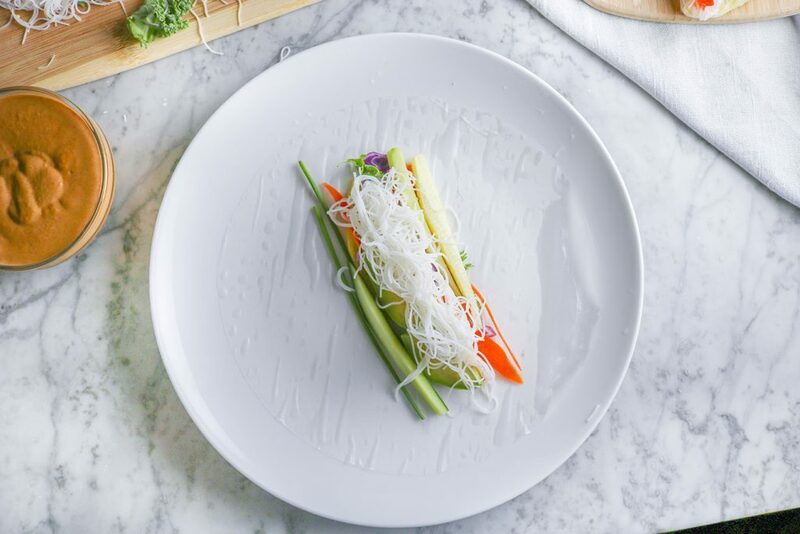 In a row across the center, place a small handful of vermicelli then top with a few pieces of shrimp / vegetable / herb desired. Leave about 2 inches uncovered on each side. Fold uncovered sides inward, then tightly roll the wrapper (like a baby burrito!). Set onto a plate or board for serving. Repeat with remaining ingredients. (To keep assembled rolls fresh, cover with a damp cloth). Serve immediately with Spicy Thai Peanut Sauce. Storage: Best when enjoyed right away! 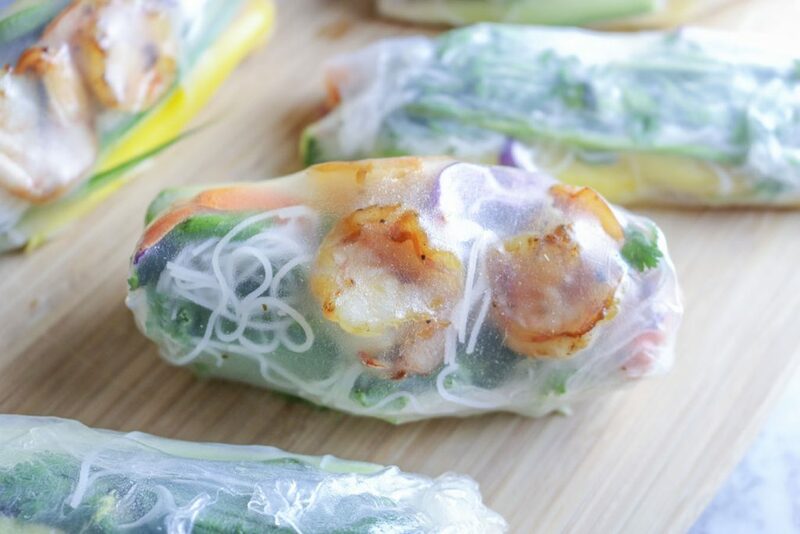 If you must, refrigerate ingredients separately then assemble into rice paper right before enjoying. If assembled rolls are leftover, cover with damp cloth before placing in refrigerator. You can find the recipe for Spicy Thai Peanut Sauce here!